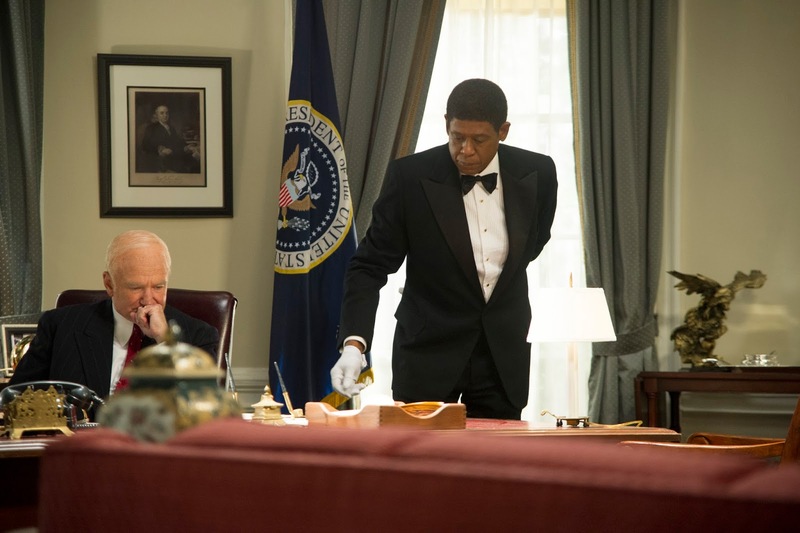 The story of a black butler who served at the White House under numerous administrations, The Butler is a mildly enjoyable drama centred on the history of the black civil rights movement as experienced from a unique vantage point. On a Georgia cotton plantation in the 1920s, Cecil Gaines is a young boy helping his parents in the fields when his mother is raped and his father is killed by the farm's owner (Alex Pettyfer). The plantation's matriarch (Vanessa Redgrave) takes pity on Cecil and converts him to a house servant. As a teenager, Cecil leaves his origins behind and makes his way north, stumbling into a job at a modest hotel and eventually securing a position at the fancy Excelsior Hotel in Washington DC. By the late 1950s Cecil (Forest Whitaker) is offered the coveted position of White House butler, with Eisenhower (Robin Williams) and his Vice President Nixon (John Cusack) in office. Cecil marries Gloria (Oprah Winfrey) and they start a family, although his long hours at work take a toll on their marriage. Their son Louis (David Oyelowo) grows into an idealistic young man seeking to translate theoretical black rights into actual societal change in the South. Much to Cecil's consternation, Louis becomes an activist who lands in jail with alarming regularity, and eventually joins Dr. Martin Luther King's circle. Meanwhile, Cecil observes the successive administrations of Eisenhower, Kennedy (James Marsden), Johnson (Liev Schreiber), and Nixon grapple with the changing social landscape, as blacks slowly and painfully gain the rights to equal treatment. Very loosely inspired by the life of Eugene Allen, who worked as a White House butler for 34 years, The Butler (also known as Lee Daniels' The Butler) is a staid recounting of the civil rights movements from the late 1950s to the election of Barack Obama as the first black President. Directed by Daniels, the film revisits familiar material from the Eisenhower, Kennedy, Johnson, Nixon and Reagan eras (Carter and Ford are afterthoughts), as Cecil Gaines finds himself with an unlikely front row seat to more than 30 years of White House history. The Butler suffers from being an observer of history rather than having any meaningful part in shaping it. Cecil Gaines actually instigates precious little over the more than two hours of running time. History happens around him, and he catches snippets of it. While the focus on the civil rights struggle provides an admirably concise summary of an essential slice of American history, the film never gains traction as a drama and does not generate any emotion momentum. All the screen time invested on Gaines' family life, including Gloria' frustration with her husband's long absences, her drinking problems, and her toying with the idea of an extra-marital affair with a neighbour (Terrence Howard) is quite mundane and more tedious than engaging. Daniels and screenwriter Danny Strong go looking for sources of tension, and find them more in the fully manufactured story of Louis Gaines. The activist son fighting at street level in the deep South for the meaningful fulfillment of black rights is carrying on his father's legacy, but of course Cecil only sees a headstrong young man potentially throwing away a hard-earned opportunity for a respectable life. Louis appears to show up at every major incident in black history, including Dr. Martin Luther King's motel room on the day he was killed. The estrangement between father and son takes over as the focal point of the film, but is too easily fabricated and just as conveniently resolved. Forest Whitaker is fully committed in portraying Cecil from a young man carving out the early stages of his life to a stooped old grandfather witnessing the election of the first black US President. The performance is good, but is more concerned with studious aging rather than capturing any compelling dynamism. David Oyelowo provides the most watchable character, bringing a steely eyed intensity to the generation of black youth that pushed a dream into real change. The huge supporting cast includes Cuba Gooding, Jr. as another White House butler, while Alan Rickman and Jane Fonda bring Ronald and Nancy Reagan to the screen. The Butler moves with elegance, and allows events to surround him while maintaining a watchful eye. The film offers as interesting a perspective as can be expected from the standpoint of the silent witness.